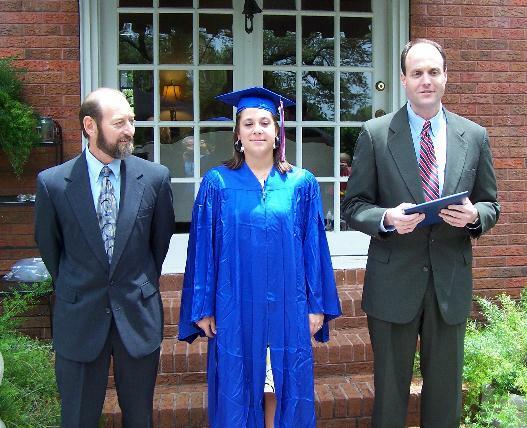 For a race car drive from Alabama Talladega Superspeedway is sacred ground for Mobile�s Thomas �Moose� Praytor Dega is so much more. �We literally have 2 races on the calendar circled that we think we have our best shot to win at, Daytona and Talladega,� said Praytor. 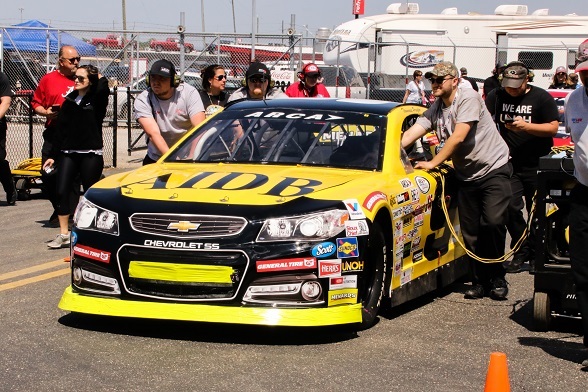 With such a short turn around from Salem�s race on Sunday, the Mobile, Alabama based teams resources were pressed to the max getting motors and cars prepared for Talladega. Better late than never the team pulled in to Talladega Superspeedway on Friday before the gate opened for the second day of the two day event. As usual, the games played during group qualifying found Praytor on the short end of the stick and the AIDB Chevy would roll off 28th. As luck would have he wasn�t the only fast car stuck in the back, Bobby Gerhardt and Sean Corr were there with him. With the drop of the green flag the Moose was rumbling. Three wide, four wide if he could sniff some air he was there. In just 10 short laps Praytor had moved all the way up from 28th to 14th and was looking for more. Spinning up and then down the track the nose took a big hit at the end of the embankment. On pit road the UNOH over the wall guys taped up the nose and sent Praytor back out still on the lead lap. Coming back to the green some debris caught the left front and Praytor had to come back to pit road for tires. The remaining laps were spent picking off cars hurt worse than the AIDB Chevy and what had started with so much promise ended 21st. SPOTTER: At the races that are companion events with the Sprint Cup Series, Praytor will continue to utilize Pensacola native Tab Boyd. 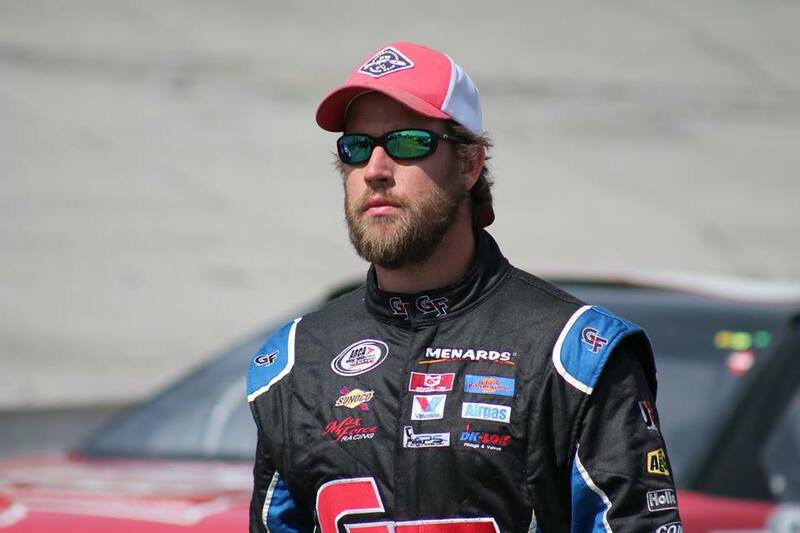 When he is not moonlighting for Praytor, Boyd is William Byron�s new spotter in the Monster Cup Series. CAR: MF002 The team has been working on this chassis for the last 5 seasons for exclusive use at Daytona and Talladega. It�s paid off with the car and Praytor drafting to their way into the top 5 in the last 5 plate races. 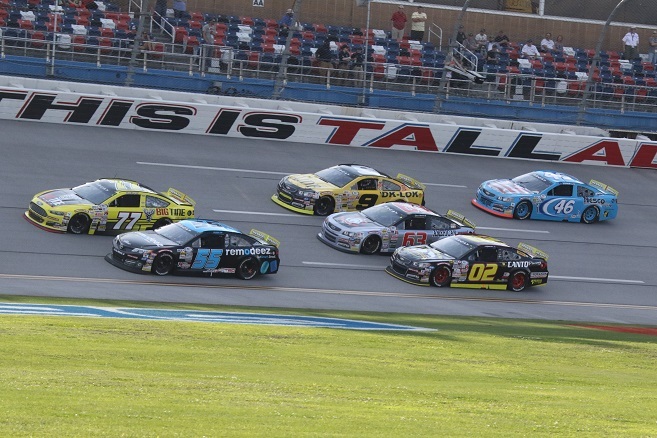 Expect more bold moves at Talladega. WHAT TO LOOK FOR THIS WEEKEND: The name of the game this week will go something like the Toy Story theme song �You�ve got A Friend in Me�. This week is all about strategy and partnership. Starting with group qualifying, either your group finds a friend in one another or� you�ll be in the dust. Same goes for the race, you have to find that right draft group that will stick with you until the end. The fans will be in for a ride to see who finds their �Friend until the End� or will be stuck solo. Oh and last thing.. STAY OUT OF THE BIG ONE! 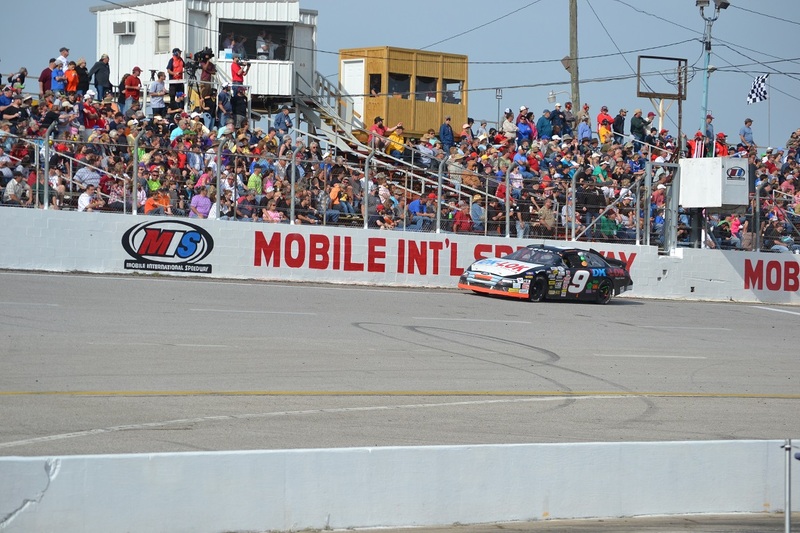 Salem Speedway has become a second home for Thomas �Moose� Praytor with the Mobile, Alabama native making more starts at Salem than at any other track on the tour. �Our brakes have really been frustrating this season. We rebuilt and replaced we thought almost everything. We did make it better but still not what we needed. 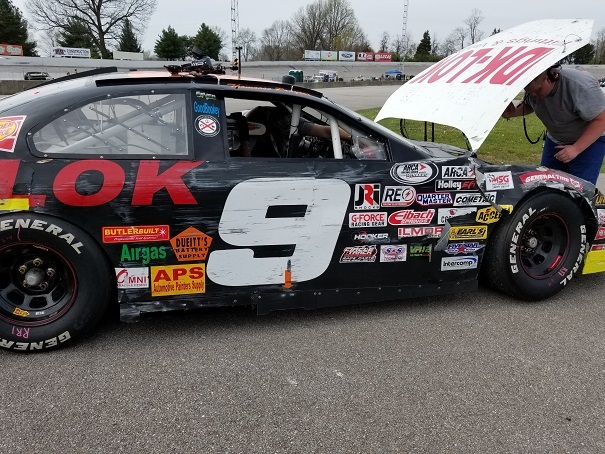 The competitors at this year�s Music City 200 in Nashville were met with snowflakes and cold temps on Saturday morning at what was supposed to be one of the hottest short track double headers of the season. 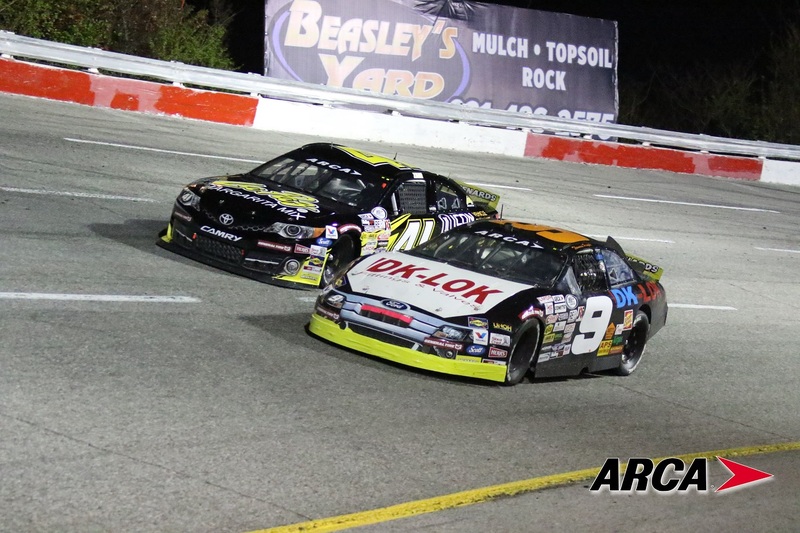 The weather finally cooperated letting the ARCA cars and the Southern Super Series Late Models on track and it didn�t take them long to put out some heat! During the early laps of the race Praytor made headway into a stout field of cars but around lap 30 the day started to go sour. 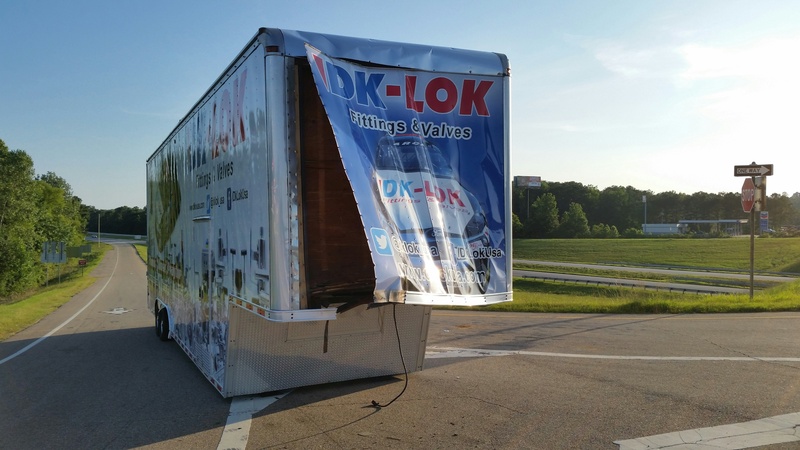 The DK-LOK Ford went from contending to hanging on. Praytor held his own but was slowly dropping back until just past the halfway mark when a first race, rookie competitor decided he needed a caution and wrecked the Moose to get it. 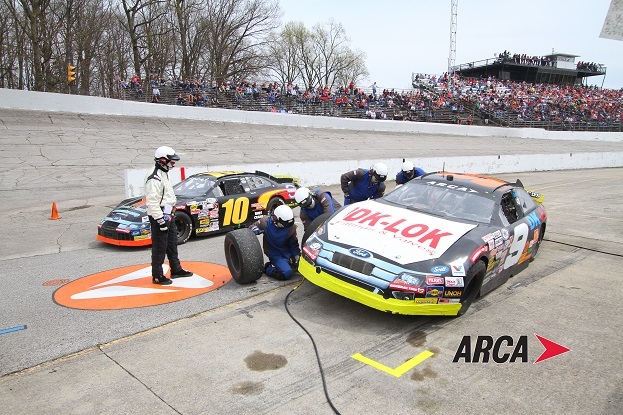 The final laps were uneventful for the DK-LOK Ford and Praytor rolled it home 18th. Pictures: Top-Praytor trying to hold off race winner Zane Smith. Bottom-Praytor going the wrong way after getting turned. 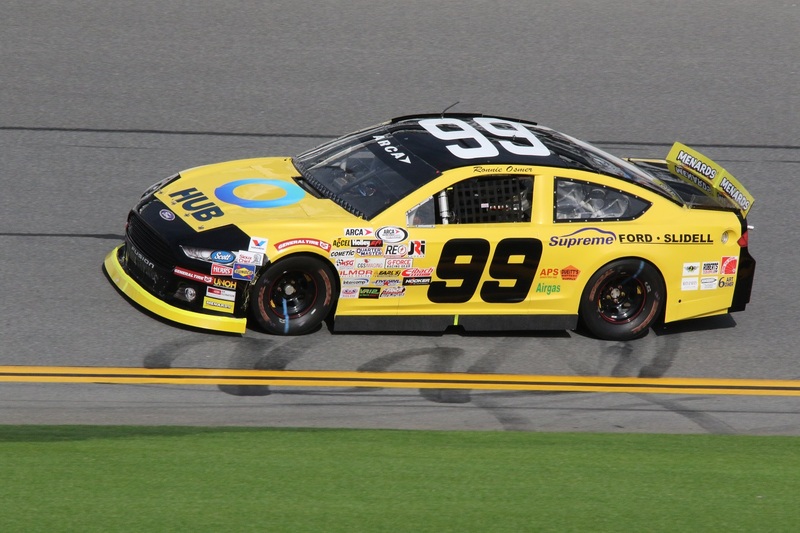 With a new paint scheme and whole lot of attitude, Thomas �Moose� Praytor began his 20th Season of Racing at Daytona International Speedway in the Lucas Oil 200 presented by General Tire. �Our car has been bad fast since the very first composite body test at Talladega last year and we�ve been waiting on February 10th,� said Praytor. 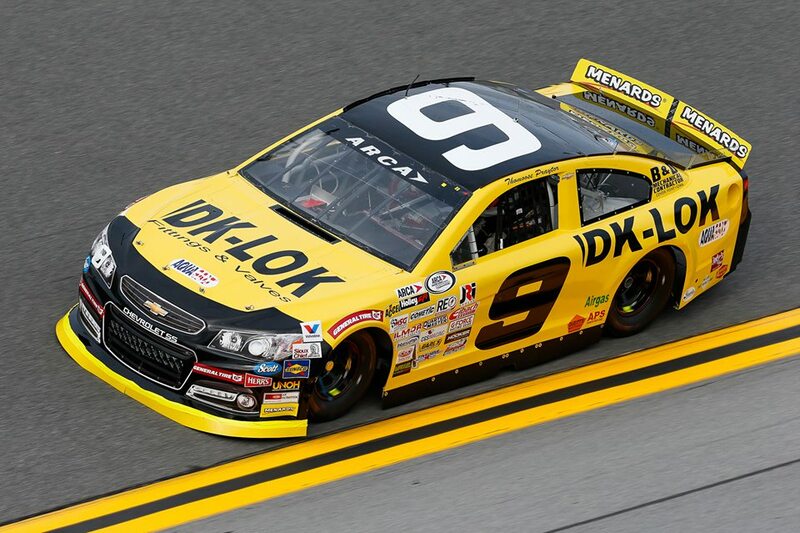 The DK-LOK Chevy quickly drew notice at Daytona with the return of the Moose�s �Black & Yellow� Paint scheme rolling through the garage. It got even more attention when it made its first laps in the draft. 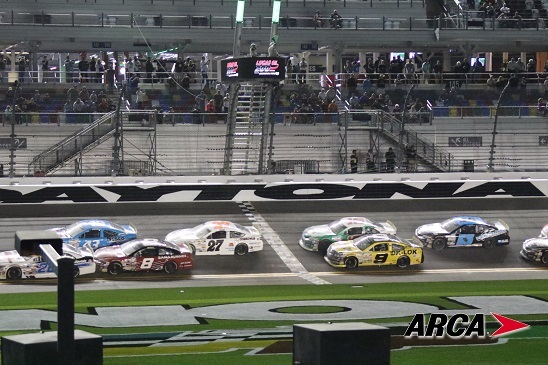 With the drop of the green flag the Ironman of the ARCA Series didn�t show any rust as he quickly started drafting towards the front. Praytor and Gerhardt quickly made up 10 or 12 spaces when the first caution flag of the day flew. Things were about to get interesting. 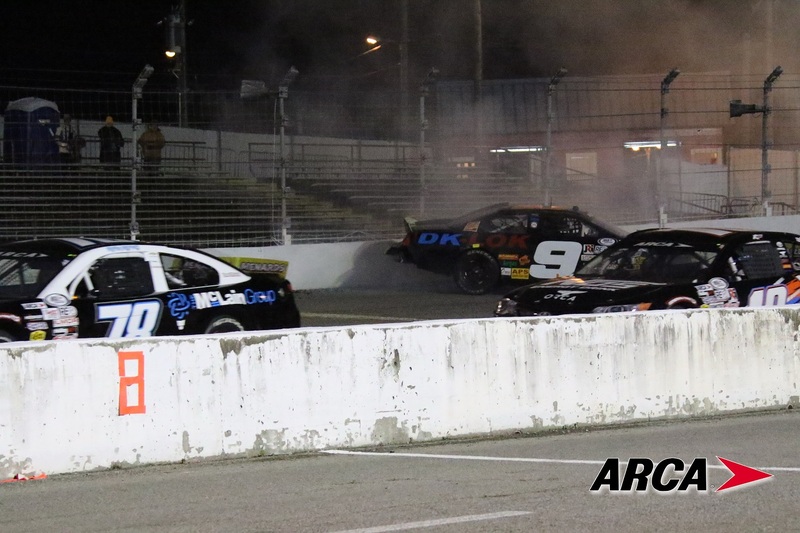 The caution was for teammate Ronnie Osmer�s Ford that had gone up in smoke off of turn 4. 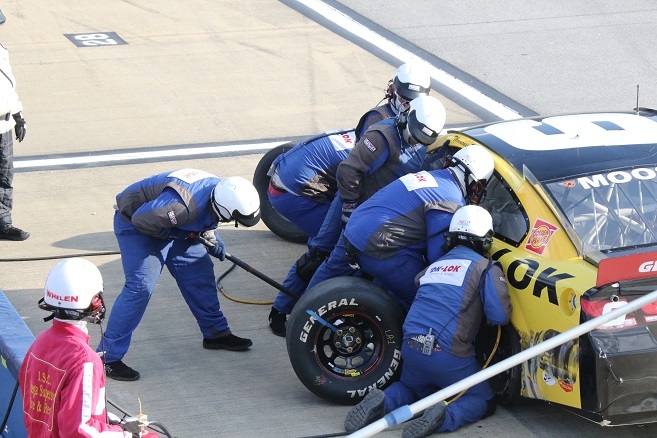 While the leaders including Praytor lined up to come to pit road for fuel bad stuff was happening in Praytor�s pit box. Osmer brought his car to rest in his stall, which was one behind Praytors. The team started to push Osmer�s car to the garage when an official stopped them in Praytor�s pits, leaving the Moose nowhere to go. When Praytor returned to the racing surface all of the gains he had made were wiped out and then some. The effect was like waving a red cape in front of a mad bull or in this case a mad Moose. Within 10 laps Praytor had gained back all the ground he lost and was on the back bumper of Bobby Gerhardt. With so much success picking up spots, a mid-race caution let Praytor come back to pit road to top off and ensure himself enough fuel to go the distance and into overtime, little did he know. With the laps winding down the level of intensity was picking up with give and take turning into take only. Praytor seemed to be at the epicenter of every big wreck leading to the finish. The first big one happened in turn 2 with the Moose sweeping to the outside to use a hole that closed behind him, collecting more cars. On the first final lap a car ended up on his side sliding down the backstretch. Praytor dove low launching his DK-LOK Chevy in the air over the grass somehow landing on all fours and still pointed straight. Praytor was now 5th with an overtime lap to settle it. The melee set up another single lap for the finish. 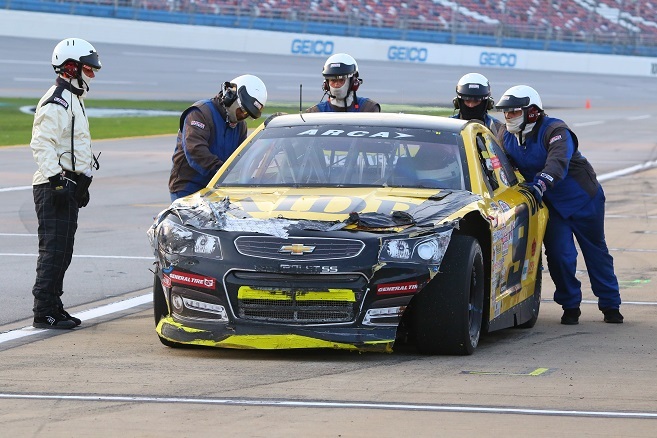 Praytor�s once shiny new car was now a mangled mess but all it needed to go was 1 more lap. The Moose got a push to pit road and the taping, pulling and shoving started. Several times through the Moose returned for the final lap. A final lap that didn�t go as planned. 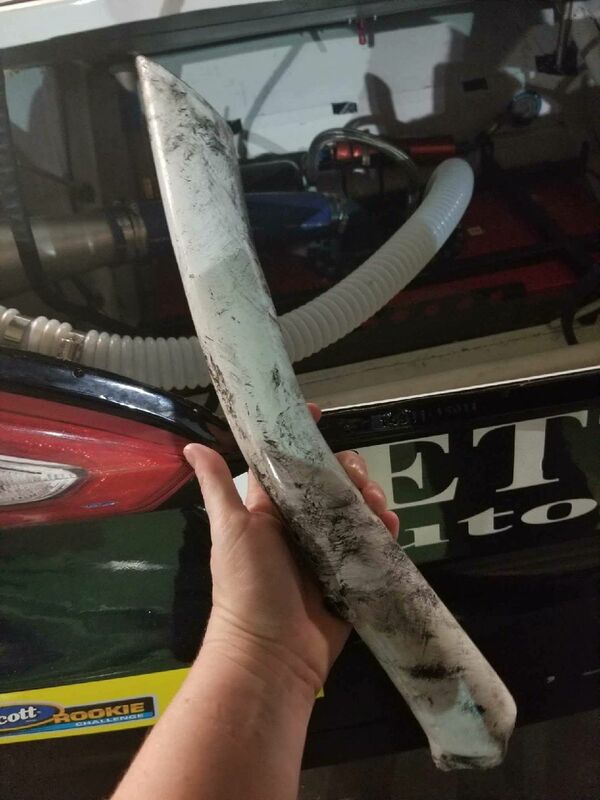 On his way to take the green flag, Praytor�s Chevy must have had some body parts still hanging loose and a piece get into the right front tire, blowing the tire and taking out the right front fender. Instead of making a charge to the end Praytor limped home to a 14th place finish. 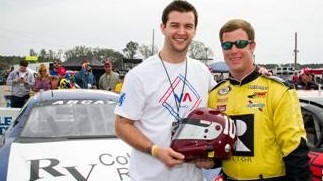 Watch Thomas Praytor and Randy Patrick Saturday night on WKRG TV 5 Special "Countdown to Daytona" at 6:30 CST. 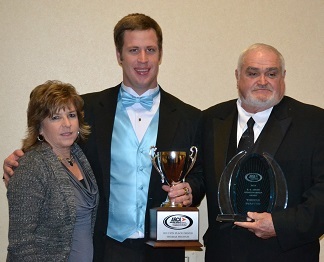 The Lucas Oil 200 Driven by General Tire: Thomas �Moose Praytor heads to Daytona International Speedway to start his 20th season of racing competition and his 102nd consecutive ARCA Race leading all ARCA Competitors. 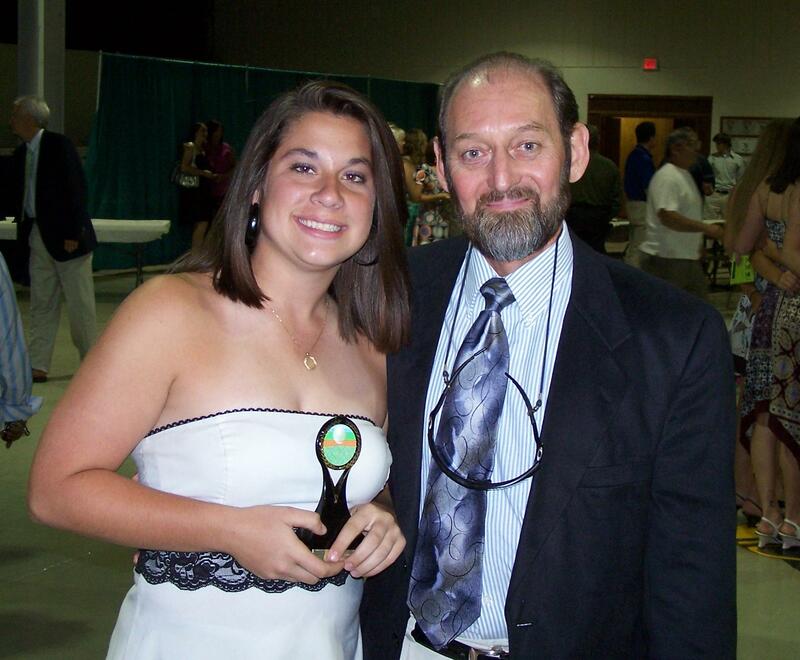 �What a ride! Hard to believe, it just seems like yesterday we were racing karts at J & J Speedway.� Praytor heads to Daytona with a new car, a new paint scheme and fresh Ilmor power plant. 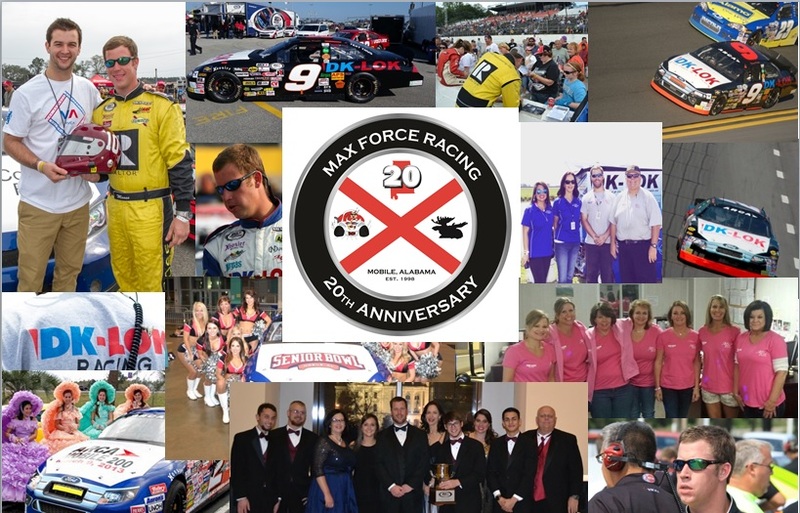 �Each year we�ve tried to improve our program and this year we are coming to Daytona with one of the best cars we�ve ever taken to the race track. 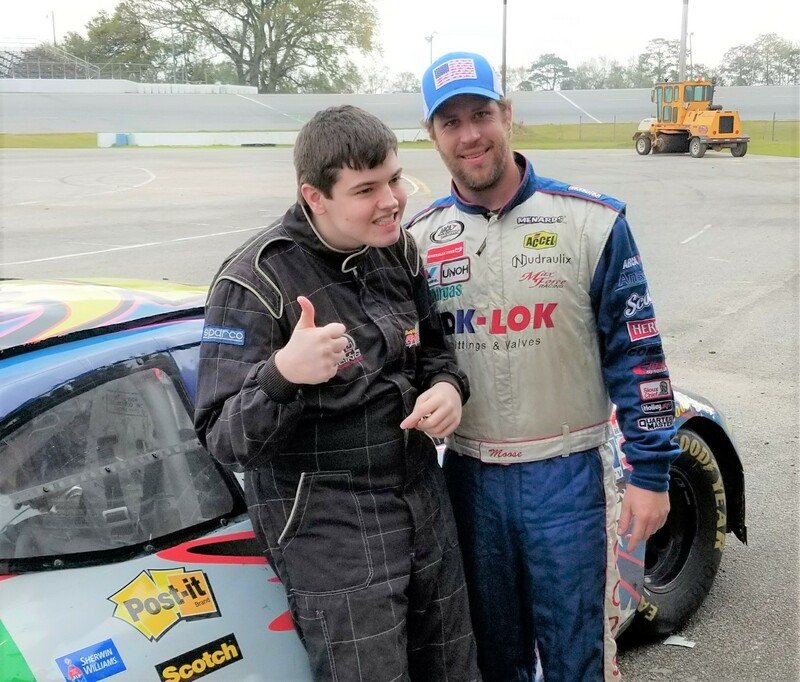 Our guys have been working hard back in Mobile and we have a really nice piece for Daytona.� Along with a new car Praytor has another Mobile-5 Flags Driver, Ronnie Osmer as a teammate. �Ronnie has a done a great job at the test and in the shop, he should have a solid effort on Saturday.� Mobile has 3 drivers at Datyona this weekend, Osmer, Praytor and Dave Mader. Mader is a member of the Alabama Racing Hall of Fame and his last trip to Daytona was in 1992 trying to make the Daytona 500. CAR: MF002 The team has been working on this chassis for the last 5 seasons for exclusive use at Daytona and Talladega. It�s paid off with the car and Praytor drafting to their way into the top 5 in the last 4 plate races. The Lucas Oil 200 Driven by General Tire is a long 4 day event with technical inspection all day Wednesday and Thursday morning before the first round of on track activity Thursday afternoon from 4:00- 6:00 EST. Friday morning is the final round of practice with Menards Pole group qualifying at 3:30 EST. 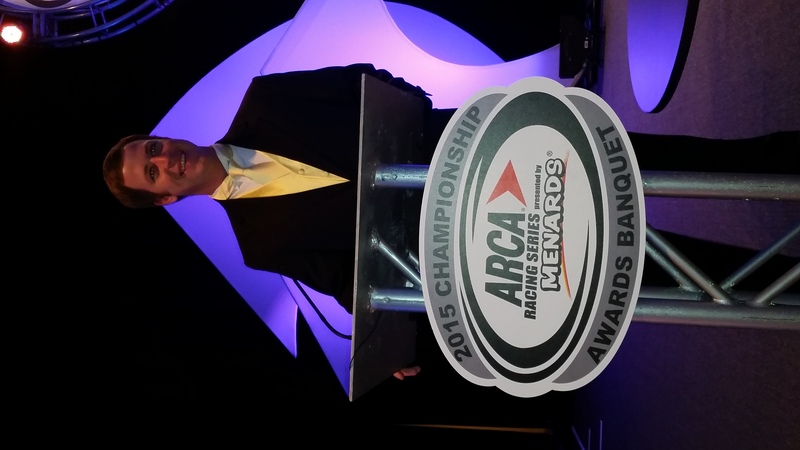 On Saturday the 65th ARCA Season presented by Menards gets underway at 4:15 EST. Live timing and scoring for practice, qualifying and the race will be on ARCAracing.com. This race will be televised live on Fox Sports 1, Channels in Mobile Comcast/Xfinity 49/241HD, Mediacom 52, Direct TV 219, Dish 150, AT&T Uverse 652. WHAT TO LOOK FOR THIS WEEKEND: While Praytor is a Superspeedway Veteran the field will be filled with Rookies and first time starters expect plenty of excitement. Fuel and luck will be the key to a good finish.